In any case, there’s hardly any doubt that several early Porsche models paved the way for jaw-dropping car design that focuses on the driver as the center of the experience (to reiterate our point from above). To pay tribute to the lineage of our favorite line of vehicles ever produced, our Porsche Pasadena pros are going to take a high-level look at several older Porsche models in today’s blog post. After you’re done reading this, we don’t blame you if you’re off searching for the next collector’s Porsche to add to your (presumably growing) inventory! Of course, regardless if you own multiple classic Porsches or you’re content with just owning a tried-and-true Cayenne for the simple pleasure of taking a high-performance vehicle off the beaten path, HOUSE Automotive caters to any and all Porsche owners. 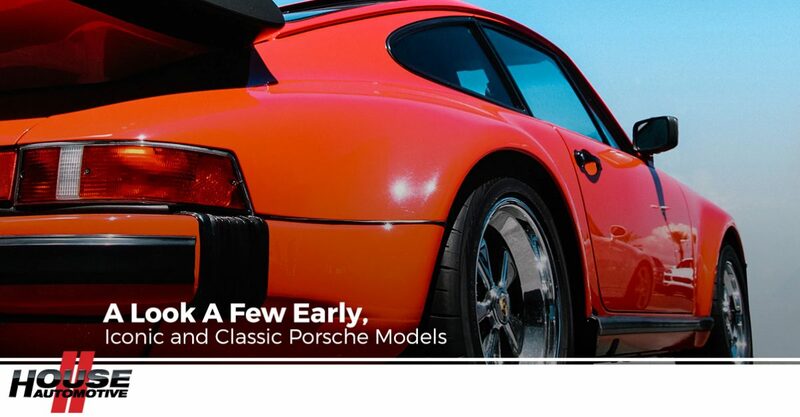 From classic Porsche service all the way to working on the iconic Carrera GT, we consider ourselves the authority in comprehensive Porsche factory maintenance in Pasadena, the greater Los Angeles area, and beyond. From aftermarket exhaust installations to a routine Porsche oil change, let HOUSE Automotive take care of your ride by getting in touch with our Pasadena Porsche specialists today. If you’re guessing if this is Porsche’s very first production automobile, then you’d be correct! Based on its cousin, the Volkswagen Beetle (if you’ve spent any time watching Top Gear (UK), you’d know that Jeremy Clarkson is typically very eager to point out this fact), imagine the 356 as a much more nimble, lightweight and way better-looking version of the original Beetle. Ferdinand Porsche himself designed the Beetle, and so the lineage only makes sense — his son, Ferdinand “Ferry” Porsche, created the 356. Complete with a four-cylinder, air-cooled rear-mounted engine, the 356 also featured a unitized pan and body construction. True Porsche historians consider the 356 to be legendary in its stature, namely because various engineering innovations that continued throughout the development and manufacture of the 356 gave rise to Porsche’s eventual motorsport success and popularity. General production of the 356 started in 1948 and, impressively, continued all the way to 1965. The 911 replacement model soon followed after it’s 1963 debut, eventually paving the way to what we now know and love as the Carrera 911. Roughly 76,000 356 models were produced, and approximately half of them still survive — you might find a few of them driving around in Deutschland! Before the Carrera 911, there was the original Porsche 911. Known for its rear-engined, air-cooled design, the classic 911 has enjoyed an extensive history of modification for the purposes of racing, rallying, and just plain looking good for people to gaze and appreciate. As the more powerful, larger and more comfortable replacement for the Porsche 356, the OG 911 featured a new 2.0-liter flat-six engine. Porsche is, of course, well known for their flat-six engine design, referring to the placement of the engine’s cylinders. This early flat-six engine was capable of producing roughly 130hp — nothing too crazy by today’s standards, but in the mid-60s, that was some pretty serious power available at the touch of a pedal! In 1967, the 911 was available as a “safety cabriolet” (the Targa), featuring a permanently mounted roll-over bar and removable soft top. Around this time, the 911 was also released as the 911 S, featuring the first true engine derivative at the time. Packed with an impressive 190hp, the S model was also the first 911 model to receive a “Fuchs” rim style or the distinctive 5-spoke design that Porsche used for several decades thereafter. Pushing the very limits of what was possible with automotive engineering at the time, we skip ahead to the engineering prowess of the 959. With just 252 models ever produced, the Porsche 959 was a massive deal, to say the least! Featuring a biturbo flat-six with water-cooled 4-valve cylinder heads and an electronically-controlled chassis and cutting-edge all-wheel-drive system, the 959 was designed not only to turn heads but to perform extremely well. At the time, the 959 was by far the single fastest street-legal production car, capable of reaching top speeds up to 195-197 mph. Credited as the standard upon which modern supercars were built on — at least, technology-wise — Sports Car International even credited the 959 as number one on its list of Top Sports Cars of the 1980s. That’s not too bad for what was once a Volkswagen Beetle! When it comes to overall aesthetics and the driving experience itself, nothing compares to a Porsche. Thank you for humoring us on this one — from classic Porsche maintenance to an independent Porsche mechanic specialist that you can trust, reach out to HOUSE Automotive today! Schedule An Appointment With HOUSE Automotive Today!